How Did the First Guide Dogs Originate and How Much Does it Cost to Train With a Seeing Eye Dog? 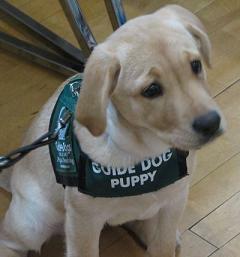 Guide dogs, also known as seeing eye dogs, are dogs trained to lead blind and vision impaired people around obstacles. Although guide dogs can be trained to navigate various obstacles, they are partially color blind and are not able to interpreting street signs. The human does the directing in these instances, based on skills learned during mobility training. Guide dogs were documented as far back as the mid-16th century, and the first guide dog training schools were established in Germany during World War I to aid returning veterans who were blinded in combat. The first guide dogs in Britain were German Shepherds, and these days, Labradors are commonly used. At the Seeing Eye in New Jersey, the heavily subsidized cost of a seeing eye dog to the student is just $150. According to its website, that price includes just about everything from the dog to boarding and travel expenses. However, a review process selects only good candidates who can care for both the animal and themselves. At the end of the four-week course, the student goes home with a new companion and, hopefully, a new level of independence. How Are Seeing Eye Dogs Taught to Interpret Stoplights if Dogs Are Color-Blind? How Much Does a Good Dog Sled Cost and How Much Are Booties For Dogs? Where does the phrase “to ride the gravy train” come from and What does gravy train mean?